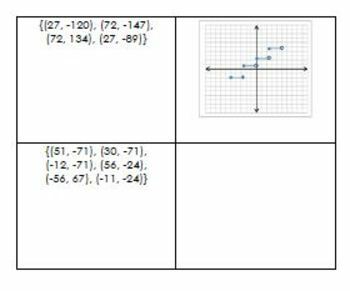 Functions may be represented in many ways, and students need to be able to identify them no matter the form. 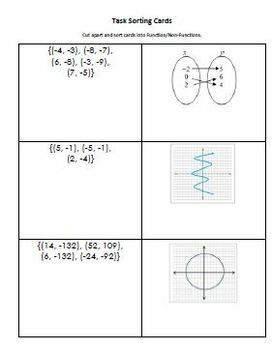 This worksheet provides 15 representations that students must identify as functions or not, and give the domain and range where applicable. As an extension students could be asked to give the functions in table format. 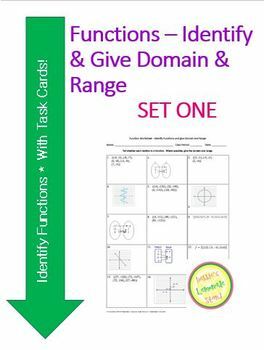 *** NEW January 2014: Task cards are also included that may be cut apart and sorted into function and non-function categories. CCSS.Math.Content.8.F.A.1 Understand that a function is a rule that assigns to each input exactly one output. The graph of a function is the set of ordered pairs consisting of an input and the corresponding output.